March 29, 2019 - Incidence of C Difficile Infection Lowered With Decreased Antibiotic Usage Infectious Disease AdvisorFacility-level rates of hospital-onset Clostridioides difficile infection have been found to decrease correspondingly with lower usage of antibiotics. March 25, 2019 - C difficile Infection in Surgical Patients Guidelines (2019) Medscape2019 guidelines on Clostridioides (Clostridium) difficile infection in surgical patients by the World Society of Emergency Surgery (WSES). April 11, 2019 - Immuron Receives U.S. Patent on Drug Composition to Treat Clostridium difficile GlobeNewswireCompany Provides Update on Status of IMM-529 Clinical Trial and New Strategic Focus Key Points. April 2, 2019 - National C. diff Summit and D.C. Lobby Day to Drive Action Infection Control TodayPeggy Lillis Foundation will host 25 advocates from 14 states at the National C. diff Summit. April 4, 2019 - Multidrug-Resistant Infections Can Cost $4600 Per Hospital Stay HealthLeaders MediaClostridium difficile infections in the hospital setting have the biggest treatment price tag, researchers say. 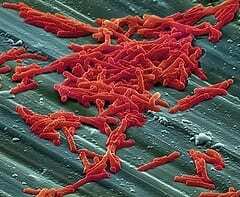 Could C. difficile also be transmitted via our food?